A huge team of scientists around the world has for the first time witnessed the violent events that lead to the creation of gold, platinum and other heavy metals across the Universe. In a major international scientific discovery, researchers including teams here in Ireland, have recorded the merger of the collapsed cores of two extremely dense but small stars, known as neutron stars. The discovery is particularly significant because not only was the merger detected by two separate instruments measuring gravitational waves generated by the event, but the light from it was also recorded by a range of powerful telescopes. The hugely important findings represent a number of scientific breakthroughs, confirm a series of long-held fundamental theories about our Universe and open a new window on it. "This discovery opens up a whole new dawn in physics and astrophysics," said Professor Stephen Smartt from the School of Maths and Physics at Queen's University Belfast, who was highly involved in the discoveries. The extraordinary event was first picked up on August 17th of this year when the Laser Interferometer Gravitational-Wave Observatory (LIGO) in the US alongside the VIRGO interferometer in Italy recorded gravitational waves hitting Earth as the neutron stars came together for about 100 seconds. These are ripples in the fabric in space time caused by some of the most violent and energetic processes in the Universe, first predicted by Albert Einstein in 1916 in his General Theory of Relativity and first recorded by LIGO in 2015 from the collision of two black holes. Two seconds later, the space based NASA Fermi telescope and European Space Agency's INTEGRAL observatory both picked up a short burst of gamma-rays coming from an explosion in the same part of the sky. Gamma-rays are high energy electromagnetic radiation, just like optical light but with 50,000 times more energy. Because LIGO and VIRGO were only able to narrow down the area of sky from where the waves came from to a section containing millions of stars, an international collaborative effort was mounted to try to pinpoint the source. Powerful telescopes at the European Southern Observatory's and other sites in Chile, as well as instruments in the US, were trained on the area to see if they could detect new light. Before the night was out, a number of different observatories had picked up a new twinkle in the sky. It was near the NGC 4993 galaxy in the Hydra constellation, around 130 million light years from Earth. Over subsequent weeks, an extensive observation campaign using a variety of instruments was mounted around the globe and in space to try to learn more about what had caused the new pinpoint of light. Pooling their data, over 3,000 scientists across six continents have now concluded that it was caused by the merger of two neutron stars, which generates a catastrophically violent explosion. 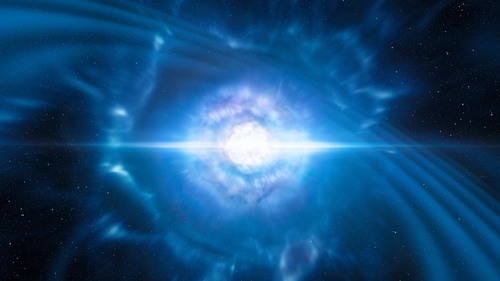 Analysing the data with colleagues who are part of a European collaboration known as ePESSTO, Dr Morgan Fraser, Research Fellow at UCD's School of Physics found this explosion matched the theoretical models of a so-called kilonova. This is the first time a kilonova has been observed and scientists are astonished at how closely the reality of what happened matched their three decade long-developed theoretical models. The team, led by Professor Smartt, also discovered the first visible and infrared light associated with the new gravitational wave source. This observation is hugely important as it has enabled scientists to prove for the first time where some heavy metals on Earth come from. That's because following a kilonova explosion radioactive heavy chemical elements, including gold and platinum, that are formed by nuclear reactions, are thrown out into space. "We immediately took a spectrum at the first opportunity - a measurement that splits light up into its different components," said Professor Smartt. "When the spectrum appeared on our screens I realised that this was the most unusual flash in the sky that we’ve ever seen." "I thought at that point that the merger of two neutron stars was almost certainly the source of the gravitational waves and all of our data confirmed that it was indeed the source." Gradually the scientists also observed the colour of the kilonova alter from blue to red over a number of days. The discoveries are being hailed by astrophysicists as the most important of a generation and for most a once in a career event. "Since the first discovery of gravitational waves 2-years ago, astronomers have been working hard to find their counterparts at optical wavelengths," said Dr Fraser. "Now with today’s announcement we are seeing the dawn of a new field of ‘multimessenger astronomy’, where detections of transients across the electromagnetic spectrum, along with gravitational waves, are opening up a whole new window on the Universe." "The data from ESO telescopes also allowed the team to identify possible signatures of Cesium and Tellurium in the debris of the remains after the neutron stars merged." "Finding these elements has been a crucial discovery in understanding the source of the heavy elements in the Universe." "We can now say, with some confidence, that Cesium and Tellurium on Earth, which are for example used in atomic clocks, electronics and solar panels, would have been produced in a merger of two neutron stars in our own galaxy, more than 4.5 billion years ago." Associate Professor Sheila McBreen from UCD School of Physics was also involved in the team that analysed the gamma-ray burst picked up by Fermi. "The detection of a short gamma-ray burst associated with a binary neutron star merger is a major step forward and the beginning of an entirely new era in astronomy," she said. While Professor Lorraine Hanlon from UCD School of Physics worked on research looking at the detection of the gamma-ray burst by the INTEGRAL satellite. "These discoveries give momentum to the case for supporting Irish astronomers’ participation in international consortia that operate at the frontier of fundamental research, on a scale that cannot be achieved by any single institute or country," she said. Work was also carried out on the discoveries by Dr Antonio Martin-Carrillo and Lána Salmon at UCD's School of Physics. A series of scientific papers have been written cataloguing the findings and are being published in Nature, Nature Astronomy and the Journal Of Astrophysical Letters. "Following last year’s detection of the merging black holes by LIGO, which has just been awarded the Nobel Prize in Physics 2017, this result marks the beginning of a totally new era in gravitational wave astronomy, and in my opinion, deserves a second Nobel Prize," said Professor Luke Drury of the School of Cosmic Physics at the Dublin Institute of Advanced Studies (DIAS). He along with Professor Felix Aharonian and Dr Carlo Romoli from DIAS were involved in the High Energy Stereoscopic System or H.E.S.S. consortium that operates a high-energy gamma-ray telescope in Namibia which assisted with the follow-up campaign looking at the high-energy emissions from the explosion.